Digital TV: Is the Sky falling down? When HDTV met VOD - which pay TV option is right for you? The biggest story in TV technology for the past year has been high-definition. With a growing selection of affordable HD screens and HD sources, it's never been easier to make the jump to high-resolution viewing. But now, a new TV technology is vying for our attention: video on demand. Video on demand has been a dream of broadcasters for more than 20 years. But it's only now that high-speed broadband networks and digital TV have made it possible to send TV-quality pictures from a remote server in real time, at your request. Instead of scheduled start times, like you get on one-way services like satellite and Freeview, broadband and cable can host vast TV archives at the end of your high-speed connection. You pick from thousands of hours of TV shows, movies or music videos and watch what you want, when you want. The only catch is that these servers have to be within a few miles of your home to ensure a good-quality connection, so most cities require two or three of them. It's taking time to build up these 'server farms', but both Tiscali and BT expect to have the UK's major cities covered by the end of this year. Virgin already has a network built for most cities, and is now expanding it beyond the cable grid, using telephone networks. The alternative is to download a selection of TV shows to a hard disk recorder like Sky when it's not in use overnight. This is the basis of both Sky Anytime and Top Up TV Anytime. With current technology you can only supply 50-100 hours this way, so the selection has to be refreshed weekly, but it doesn't require a broadband or cable connection, so it's not restricted to city folk. For this group test, we've rounded up the key players in HDTV and VOD, in a quest to see which offers the best selection of high-tech TV treats. While it's fantastic to have such a great choice of TV providers these days, if you want the best selection high-definition content, then Sky still sets the standard. It fares worse if judged by its on-demand aspect alone - Anytime on Sky Plus, being a push service, can't compete against true VOD, but we suspect it's just a matter of time before Sky rolls out that as well. Virgin has shot itself in the foot by needlessly taking its war with Sky into the public eye when it should have been building a fireproof content offer. V Plus is a very good PVR, there's a reasonable on-demand archive, and just enough HD to pull it into second place. Tiscali TV powered by Homechoice is the most interesting newcomer, and has the potential to rival Virgin when its HD-capable PVR comes along later this year. It has a strong range of content, early movie release windows and it's a reliable, well-tested platform. In time, it might be an ideal choice if cable isn't available or you don't want a dish installed. The technical problems we're encountered currently make it impossible to wholeheartedly recommend BT Vision. A Firmware update and more generous VOD selection would serve this potentially exciting system well. 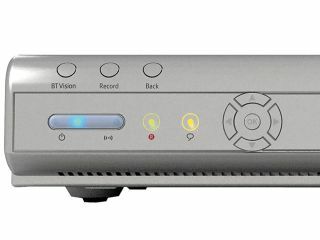 If you're thinking of buying a Freeview PVR, then you should consider Top-Up TV Anytime. Then you should consider how many DVDs of your favourite shows you could buy with the money you'll save buying a Freeview Playback PVR and not spending £10 a month. Ultimately you'll have to visit each service's website and add up what your individual needs will cost. Needless to say, with TV, phone, broadband and even mobile bundled together, you could make big savings, if you're prepared to rely on one provider for everything.